Acedia, or "the noonday demon," is the apathy, listlessness, and boredom that pulls us away from God at mid-day, mid-career, or mid-life. 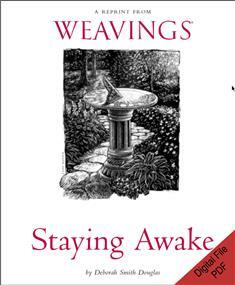 In "Staying Awake," Deborah Smith Douglas explores acedia and finds it to be "rooted not in laziness, but in sadness." Thus its remedy is not in pressuring ourselves to work harder, as to do so would be to punish ourselves needlessly and possibly worsen our apathetic condition. Douglas suggests instead that we heal our sadness by paying closer attention to God, by listening for God's movement in our work, in our prayers, and even in our own limitations. By "staying awake" to our lives as they truly are, we rediscover our joy in God; we fall in love with God again, and thus find ourselves restored and renewed.